You are currently browsing the tag archive for the ‘FEX’ tag. 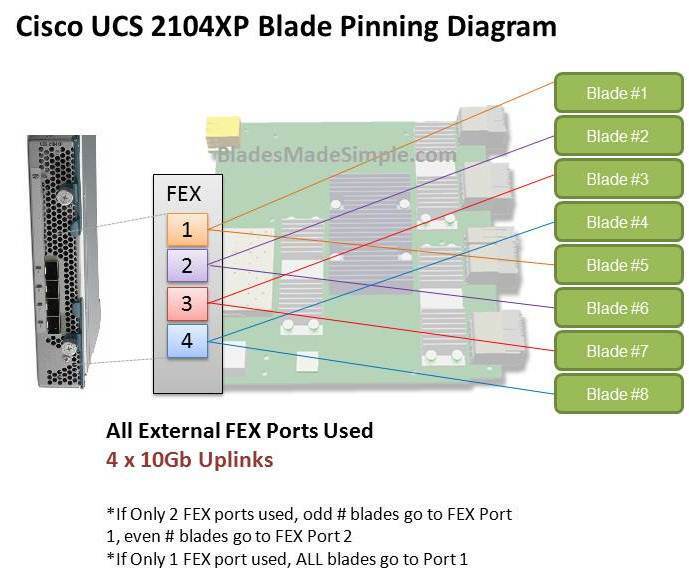 I recently heard a rumour that Cisco was coming out with an 8 port Fabric Extender (FEX) for the UCS 5108, so I thought I’d take some time to see what this would look like. NOTE: this is purely speculation, I have no definitive information from Cisco so this may be false info. 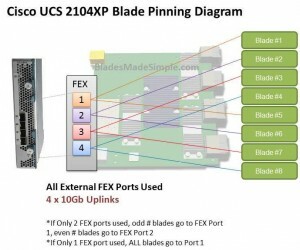 Before we discuss the 8 port FEX, let’s take a look at the 4 port UCS 2140XP FEX and how the blade servers connect, or “pin” to them. The diagram below shows a single FEX. A single UCS 2140XP FEX has 4 x 10Gb uplinks to the 6100 Fabric Interconnect Module. The UCS 5108 chassis has 2 FEX per chassis, so each server would have a 10Gb connection per FEX. However, as you can see, the server shares that 10Gb connection with another blade server. I’m not an I/O guy, so I can’t say whether or not having 2 servers connect to the same 10Gb uplink port would cause problems, but simple logic would tell me that two items competing for the same resource “could” cause contention. 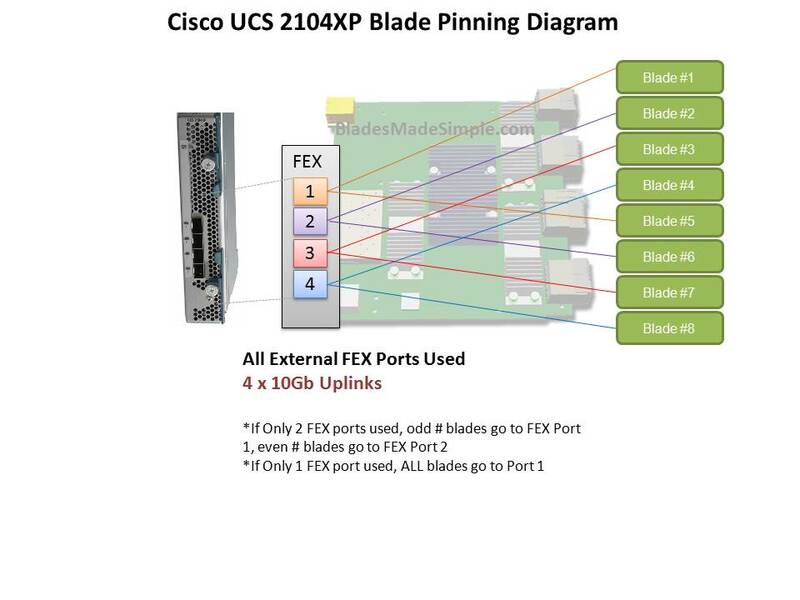 If you decide to only connect 2 of the 4 external FEX ports, then you have all of the “odd #” blade servers connecting to port 1 and all of the “even # blades” connecting to port 2. Now you are looking at a 4 servers contending for 1 uplink port. Of course, if you only connect 1 external uplink, then you are looking at all 8 servers using 1 uplink port. I’ve looked around and can’t confirm if this product is really coming or not, but I’ve heard a rumour that there is going to be an 8 port version of the UCS 2100 series Fabric Extender. 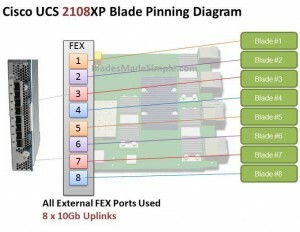 I’d imagine it would be the UCS 2180XP Fabric Extender and the diagram below shows what I picture it would look like. The biggest advantage I see of this design would be that each server would have a dedicated uplink port to the Fabric Interconnect. That being said, if the existing 20 and 40 port Fabric Interconnects remain, this 8 port FEX design would quickly eat up the available ports on the Fabric Interconnect switches since the FEX ports directly connect to the Fabric Interconnect ports. So – does this mean there is also a larger 6100 series Fabric Interconnect on the way? I don’t know, but it definitely seems possible. Previously known as “Palo”, Cisco’s virtualized adapter allows for a server to split up the 10Gb pipes into numerous virtual pipes (see below ) like multiple NICs or multiple Fibre Channel HBAs. Although the card shown in the image to the left is a normal PCIe card, the initial launch of the card will be in the Cisco UCS blade server. When you look at server workloads, their needs vary – web servers need a pair of NICs, whereas database servers may need 4+ NICs and 2+HBAs. By having the ability to split the 10Gb pipe into virtual devices, you can set up profiles inside of Cisco’s UCS Manager to apply the profiles for a specific servers’ needs. An example of this would be a server being used for VMware VDI (6 NICs and 2 HBAs) during the day, and at night, it’s repurposed for a computational server needing only 4 NICs. Another thing to note is although the image shows 128 virtual devices, that is only the theoretical limitation. The reality is that the # of virtual devices depends on the # of connections to the Fabric Interconnects. As I previously posted, the servers’ chassis has a pair of 4 port Fabric Extenders (aka FEX) that uplink to the UCS 6100 Fabric Interconnect. If only 1 of the 4 ports is uplinked to the UCS 6100, then only 13 virtual devices will be available. If 2 FEX ports are uplinked, then 28 virtual devices will be available. If 4 FEX uplink ports are used, then 58 virtual devices will be available. Will the ability to carve up your 10Gb pipes into smaller ones make a difference? It’s hard to tell. I guess we’ll see when this card starts to ship in December of 2009.